Is your BMW over 6 years/100,000 km? 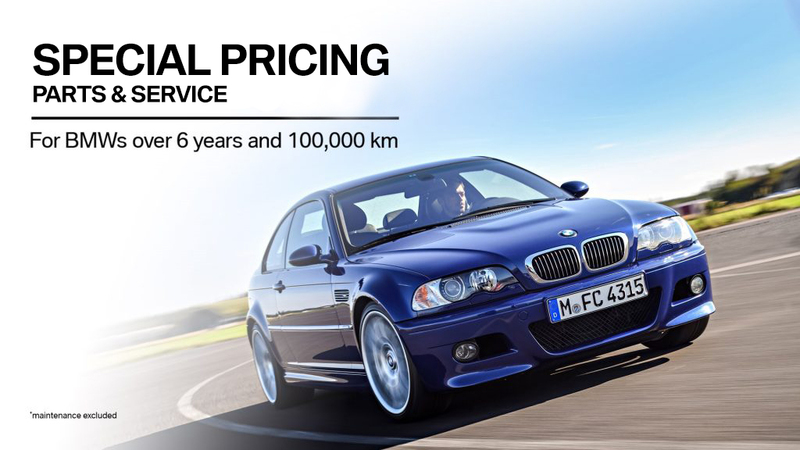 If your BMW is over 6 years old (from warranty start date) or has more than 100,000km on it, enjoy a special offer from Pfaff BMW. Ask your Pfaff BMW Service Advisor for more details. Plus, enjoy peace of mind with a 2 year unlimited mileage warranty on parts that have been replaced with OEM BMW parts. *Maintenance, tires and package-priced parts are excluded (including brakes). Parts discount only applicable when parts are installed by our service department.